England rugby internationals Chris Pennell and Lydia Thompson helped to launch this year’s Worcester Big Sleep-Out. Pennell and his Warriors team-mate Justin Clegg, Warriors co-owner Colin Goldring,Worcester Valkyries winger Thompson and Carol Hart, Head of Warriors Community Foundation, were joined by representatives of the Maggs Day Centre for the Homeless and St Paul’s Hostel. 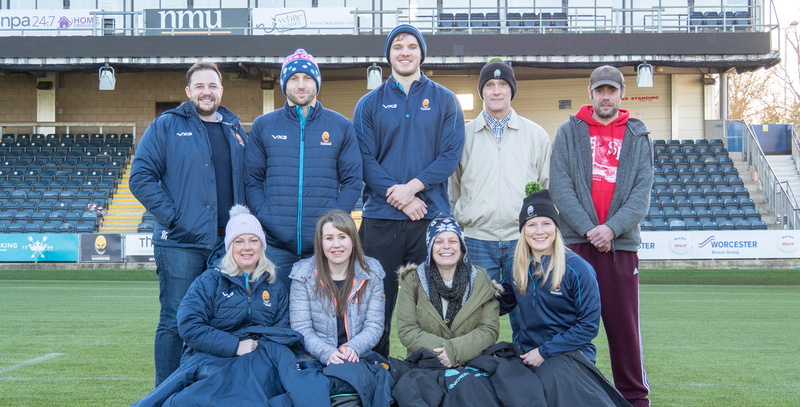 The Worcester Big Sleep-Out will take place at Sixways Stadium, home of the Gallagher Premierhip club, on April 4 with all the proceeds being shared between the Warriors Community Foundation’s pioneering homeless rugby project, Maggs Day Centre and St Paul’s Hostel. This will be the second sleep-out at Sixways with the aim of raising £65,000 – £20,000 more than last year – and attracting 100 volunteers, including community leaders, politicians, religious leaders and business people, to sleep out under the stars. Warriors full-back Pennell, a trustee of the Warriors Community Foundation, said: “As players we should be aligned and involved as much as possible with our Community Foundation and its initiatives. “It’s great to see the likes of Justin Clegg as a young man recognising the importance of that and driving the player involvement. “We are delighted to lend our support to the Worcester Big Sleep-Out by raising awareness and helping to get as many people involved as possible. As well as raising awareness we would also like to raise a decent amount of money for the three charities. Clegg’s involvement in the sleep-out continues his active involvement in community initiatives having taken the lead in Warriors’ Christmas Appeal which produced more than 400 items for the Worcester Foodbank. “Homelessness is such an important cause. There are so many people struggling in Worcester and anything we can do to raise awareness and money for the three charities can only help improve conditions for them,” Clegg said. Thompson, who has been named in England’s Women’s Six Nations squad, was inspired to support the Worcester Big Sleep-Out by the success of last year’s event. “This is such a fantastic cause. Last year it did so well and it was inspiring to hear what they did and how the money raised helped these three fantastic charities to make a difference to homelessness in Worcester,” she said. The collaborative approach of the three charities to raising awareness and money was welcomed by Mel Kirk, Chief Executive of Maggs, and Felicity James, St Paul’s Skills Development and Community Engagement Manager. “It is getting harder and harder to fund-raise. A lot of our fund raising comes through grant-making trusts and we are having to compete with more and more organisations, so this initiative is absolutely fabulous,” Kirk said. James said: “When charities work together they have much bigger impact. We can reach a much bigger audience and we can raise much more awareness.